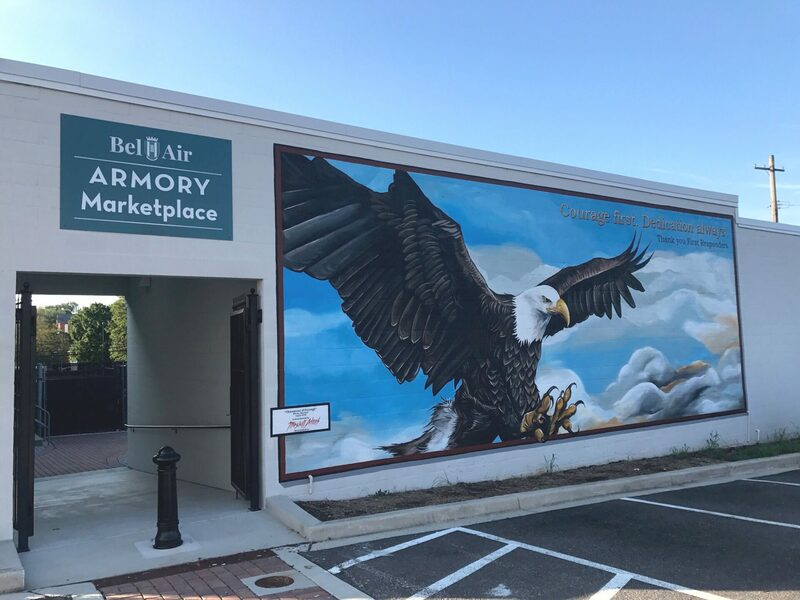 The Town of Bel Air Cultural Arts Commission recently sponsored a mural to honor the service, dedication and bravery of all First Responders in our community. Muralist Marshall Adams of Baltimore was chosen for the “Champions of Courage” project, which was completed in August 2018. The Commission felt it was important to have a piece of public art in Bel Air that expressed gratitude and showed support for the difficult work that First Responders do each day in our community. This piece, located behind the Armory at 37 North Main Street, can be viewed as a daily reminder of the appreciation the community feels toward our First Responders. These individuals put their lives on the line every day to protect and enhance our community and improve our quality of life. The Cultural Arts Commission, a group of nine volunteers appointed by the Board of Town Commissioners, felt that incorporating this mural as part of the Armory Complex was appropriate given that the historic Reckord Armory once housed the Maryland National Guard. The mural is a great addition to Bel Air’s public art landscape, which includes approximately 30 murals and sculptures. The artist for “Champions of Courage” is Marshall Adams of Baltimore. Marshall has strong ties to Harford County and Bel Air and also completed the Historic Downtown Bel Air mural on Main Street in 2013. Marshall chose the eagle because he wanted to paint a mural that would have a wide reaching audience; a mural that would be exciting to young people, while reminding more mature viewers to be grateful for the tireless efforts of our first responders. The “Champions of Courage” mural is part of a two-mile, sixty-minute Public Art Walk designed to show residents and visitors 19 pieces of public art in the Bel Air Arts & Entertainment District. Brochures for the Art Walk can be found in the Visitor’s Center in the Armory, at Harford Artists Gallery or on the A&E District website.